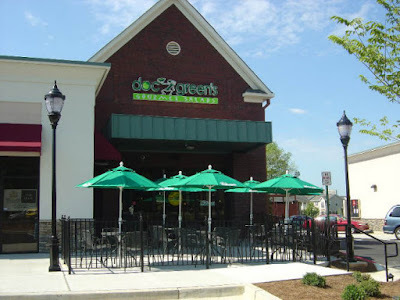 Doc Green's Gourmet Salads & Grill has closed its location at The Shoppes at Powers Ferry on Power Ferry Road, just outside Sandy Springs in Marietta. The restaurant was one of many in the center, which also includes Dunkin' Donuts, Smoothie King, Moe's Southwest Grill and Bonehead's. The restaurant reportedly closed a few days ago with no prior warning. Sources indicate that the restaurant had changed hands at least four times since opening. The closure marks the last of the original Doc Green's to close in metro Atlanta. The chain was launched by Martin Sprock's Raving Brands (known today as Big Game Brands) in early 2005. The brand was built to be a franchise from day one but never quite lived up to its lofty expectations. Raving Brands once included Doc Green's, Moe's Southwest Grill, Bonehead's Grilled Fish Piri Piri Chicken and Planet Smoothie, among other concepts. The Powers Ferry closure was preceded in death by Atlanta area Doc locations in Atlantic Station (now BGR The Burger Bar), Ponce de Leon Avenue (now Gusto! ), North Buckhead (now 521 Kitchen & Que but currently for sale), Cobb Parkway (now Otter's Chicken), Perimeter Place (empty) and The Shoppes Webb Gin (now Pho.com). Scott Rhee, former operator of the original Cobb Parkway location, reopened the restaurant with a different logo and tweaked menu but the same name last year in a different location on Cobb Parkway. In place of the former Powers Ferry Doc Green's, a new place called "ZEUS Fresh Greek Street Food" plans to open soon. Zeus appears to be a new, independently owned, non-chain restaurant that will specialize in classic Greek fare in a fast casual setting. While I have thus far been unable to confirm an opening timetable, I'd expect that Zeus will open early next year. Are you surprised Doc Green's closed just a few months away from the first pitch at nearby SunTrust Park? Why do you think Doc Green's did not find the same blockbuster success as Moe's Southwest Grill? Are you excited about the prospect of a local, casual Greek joint opening in place of Doc Green's? When I used to work in that area a couple years ago, that place was PACKED every day for lunch, but empty at night. I haven't been there in recent months though. Powers Ferry restaurants struggle for some reason despite all the apartments in that immediate area. There are a few exceptions such as Heirloom and Moe's which is always packed. I don't think anyone heading to the Braves game would be going to Doc Greens anyway so that probably didn't play a factor. There used to be one in Suwanee (John's Creek) in the outparcel next to Starbucks and in front of Target and Home Depot too. It got converted into Shane's Rib Shack, another brand of this parent. I liked the concept and the food but I think the menu was too limiting to have mass appeal. The only time I ever at at Doc Greens was at the long shuttered East Cobb location that has been a Willy's for many years. I work smack between the closing one and the one on Cobb parkway and just never had the urge to eat there. Never really been impressed and its hard to convince a number of people in my office to go out to lunch for salad. Hopefully the renaissance of office tenants along Powers Ferry and around the Braves stadium will help restaurants in the PF area and all the apartments being built help sustain them at night. It converted into a dentist. Shane's opened at the same time as Doc Green's. Definitely excited to have a Greek place opening nearby. I love gyros! If they're good, I'm sure they'll have a following...especially with the new apartments being built across the street.